A far more apparent, if distant, threat had suggested itself on May 8, 1943, when the Anglo-Americans conquered North Africa, thereby putting the Balkans within striking range of enemy bombers. Less than a month later, the Corpul1 Aerian Roman was officially activated during an impressive and popularly acclaimed parade of its crews through Kirovograd before Marshal Antonescu. The first day of August was their baptism of fire, when a flight of in-coming American heavy-bombers was detected by German Freya radar. Luftwaffe and FRAR pilots were waiting for them at altitude, but were surprised to observe not only the lumbering enemies’ low pass at just 500 feet, but their singular color scheme: all 133 Liberators had been painted entirely pink-to what end, the Axis airmen could not imagine. 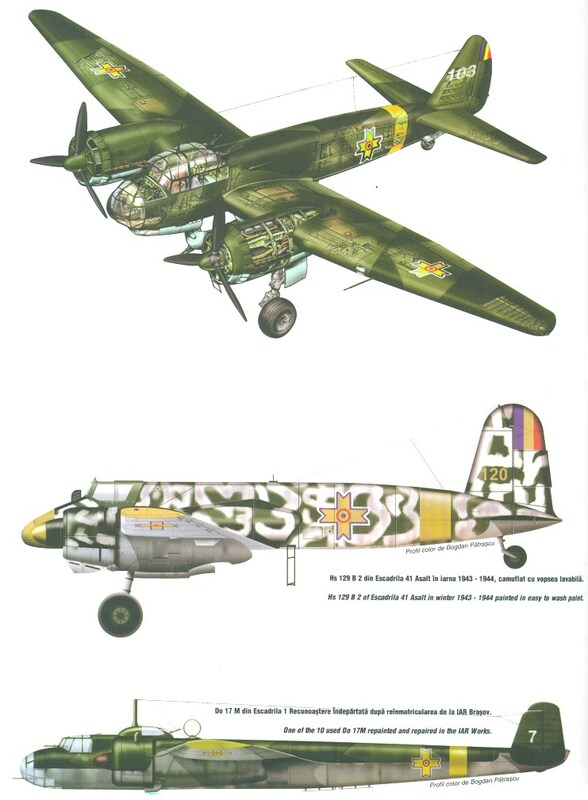 Recovering from their astonishment, they promptly dispatched nearly 40 B-24s, severely damaging another 12, for the loss of a single IAR-81 and one Romanian-flown Messerschmitt-110. The Germans lost another twin-engine “destroyer,” plus a Gustav. The object of the raid-the Ploiesti oil fields-escaped serious damage. Far from having been “knocked out;’ as the Americans claimed, production was uninterrupted, and returned to pre-attack levels before the end of the month. By spring 1944, the Allied advance through Italy made possible the construction of forward bases, bringing Romanian territory itself within easier striking distance. On April 4, Bucharest was raided for the first time by a flight of Consolidated Liberators from the 14th Air Force to bomb a civilian housing district. The capital’s medical personnel and morticians were overwhelmed with 2,673 non-combatants killed and almost as many wounded. The 15th Air Force’s alleged targets-Gara de Nord, Bucharest’s main railway station, and its adjacent marshalling yard-were unscathed, while the 57 vknatori and Luftwaffe pilots that had been scrambled destroyed 11 B-24s for the loss of three Axis airmen. The next day, 334 Liberators and B-17 Flying Fortresses from the 449th Bomber Group escorted by 119 twin-engine fighters, P-38 Lightnings, took off from Foggia, in Allied-occupied Italy. But most of the pilots got lost in deteriorating weather conditions, and just 32 bombers found their way to Romania. Many fell between ground fire and Luftwaffe and FRAR defenders. Ploiesti escaped unscathed. The American flyers’ reputation as “sky terrorists” was not helped when they machine-gunned four-victory Lieutenant Flaviu Zanfirescu while he was hanging helplessly in his parachute harness. His death was by no means an exception, as U.S. fighters routinely shot Romanian pilots bailing out of their stricken aircraft. The best-known victim was the wing commander of Grupl1 vdnatoare, Captain laon V. Sandu, the highest ranking FRAR officer to die in aerial combat, when he was killed suspended beneath his parachute by a U.S. fighter pilot. Such atrocities required none of the usual propaganda embellishments to engender a profound loathing and contempt for Roosevelt’s “Liberators;’ while stiffening resistance at all levels of Romanian society. By this time, the Romanians were supplementing their meager resources with a growing number of captured American and Soviet aircraft. These at first included a Lockheed P-38 Lightning, Consolidated B-24D heavy-bomber, several Polikarpov Po-2 general purpose “Mules;’ and many more 1-16 “Rats:” Other downed Allied warplanes would help replenish FRAR stocks. In the face of their Balkan disappointment, the Americans marshaled another raid on April 14, when more than 150 fighters escorted 448 heavy-bombers to strike at railroad yards, factories, communication centers, and troop concentrations across Yugoslavia and Romania. They were joined by RAF units, which engaged in nighttime raids against the same targets. These operations were eventually suspended after the loss of too many twin-engine Wellingtons. 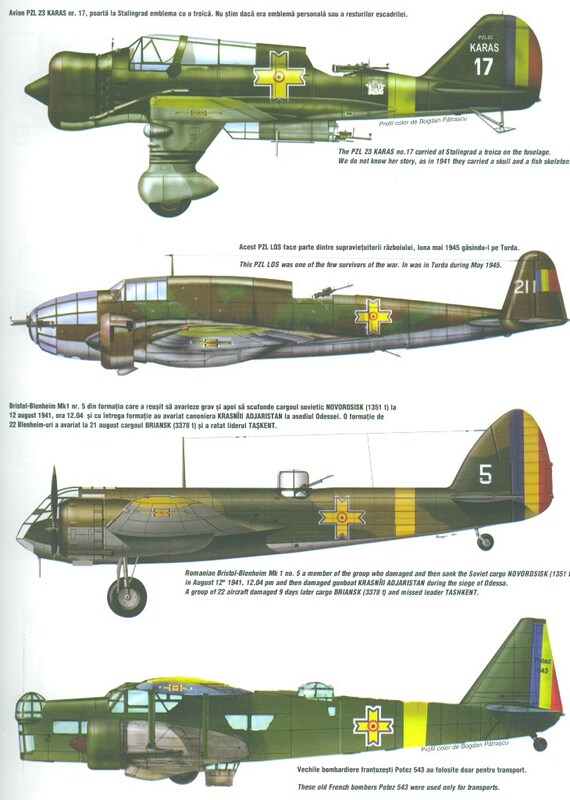 German and Romanian night-interceptors were by then equipped with Al radar sets, which allowed them to infiltrate the British formations unnoticed, then shoot down the venerable medium-bombers at will. April 21 was a black day for the vdnatori, when they met long-range USAAF P-51B/C Mustangs for the first time. Although the Romanians were out-classed and out-numbered, losing a dozen aircraft, they clawed their way against overwhelming odds to destroy six Liberators. Over the next two months, the Americans amassed more than 600 bombers protected by hundreds more P-51s and P-38s in six additional raids against Romanian targets. These overwhelming numbers prevented the relatively meager forces of the Luftwaffe and FRAR from achieving much in the way of defense. Attrition and continual repairs had reduced their interceptors to no more than 120 machines, all that remained with which to defend the entire country. As a consequence, the Anglo-Americans’ stepped-up, intensive bombing campaign went on to take the lives of 7,693 civilians, although few war plants were destroyed. Indeed, Allied photo reconnaissance revealed that Ploiesti was still functioning at near normal capacity: most of the bombs meant for the refineries and crude oil pumping plants had gone wide of the mark. Since Flying Fortresses and Liberators did not have the pin-point accuracy necessary to strike these specific targets, it was reasoned that P-38s, each carrying a single 500-pound bomb, would be better suited for scoring direct hits on such detailed objectives. Accordingly, on the morning of June 10, 46 Lightnings of the 82nd Fighter Group out-fitted as dive-bombers were escorted by an additional 39 twin-engine fighters to the great oil depot. They were detected by Romania’s Freya and Wuetzburg radar network in time for home defense interceptors to achieve altitude, falling on the low-flying Americans approaching Grupl 6 vknatoare’s base at Popest-Leordeni. The Lightnings’ own attack was their undoing, however, because the IAR 81 could outperform them at low altitude. The Romanians flew rings around the P-38s, additionally encumbered as they were by 500-pound payloads, shooting down 24 Lightnings in 12 minutes. Some tried to escape at tree-top level and crashed into the ground, while others collided with each other. Luftwaffe pilots downed five more, and flak claimed three. None of the enemy’s 500-pound high-explosives found their way to Ploiesti, and the “Forked-Tail Devils” never returned as would-be bombers. One quarter of their formation had been destroyed, “the highest loss ratio for any mission flown by a significant number of P-38s in World War Two;’ according to aviation historian, Denes Bernad. Three Axis fighters were lost in the engagement, though none to the enemy: two suffered accidents, and one was mistakenly brought down by friendly ground fire. On July 22, the vdnatori bounced an enemy formation approaching Bucharest, shooting down seven Lightnings at no loss to the defenders. They were themselves surprised, however, and traded seven of their own fighters lost, when the Americans, returning from a shuttle raid, attacked unexpectedly from the east with more than 100 P-51s and P-38s to the Romanians’ 17 interceptors. The American air offensive was relentless and gradually eroded all FRAR stocks of fighters. By August 18, attrition had whittled their numbers down to just 46 Messerschmitt Gustavs. These were nonetheless scrambled to oppose at least twice as many P-51s above the Carpathian Mountains, when Luftwaffe Major Juergen Harder shot down a Mustang, the day’s only Axis kill. The FRAR had been decimated. Ploiesti’s defense now lay primarily in the hands of its anti-aircraft gunners, who continued to knock down enemy aircraft, but never enough to deter the many hundreds of Liberators and Flying Fortresses that dominated the skies over Romania. For all their sustained operations, however, the Americans never succeeded in demolishing the great refineries, which continued to supply Axis forces, although at a diminished productivity, until Ploiesti was overrun by the Russians late in the war. On August 19, after elements of the 15th Air Force blasted the refineries for the fourth consecutive day, the USAAF headquarters in Italy received a request from the Soviet high command to cease all further attacks on Ploiesti. The Red Army was about to launch its major offensive against Romania, and Stalin wanted to capture as much of the enemy’s oil capital intact as possible. The Americans obliged him, thereby ending their prolonged, ultimately unsuccessful attempt to obliterate Ploesti or, at least, prevent its petroleum from reaching Hitler’s Panzers. 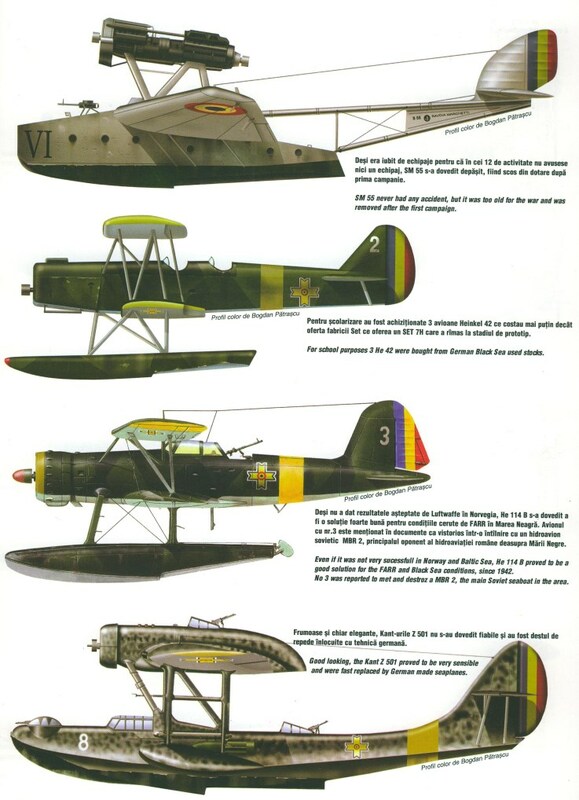 In defending this essential resource, the Romanian Air Force played a major role in the Axis war effort. From 1943’s Operation Tidal Wave to the last raid against Ploiesti in August 1944, the FRAR lost 80 interceptors, but shot down, with the help of Romania’s renowned flak gunners, 223 Anglo-American bombers and 36 fighters. Luftwaffe pilots scored an additional 66 aerial victories. Allied casualties amounted to 1,706 killed, with another 1,123 taken prisoner. While a handful of Luftwaffe fighters remained in charge of protecting the skies over their country, remnants of the FRAR were hurriedly transferred to the Jassy-Kishinev sector of the Eastern Front, where massive Soviet forces were storming the Romanian border. The Reds were covered by 1,952 warplanes pitted against a combined FRAR-Luftwaffe resistance of 250 serviceable machines. As testimony to their skill and determination during this extremely uneven confrontation, the vdnitori destroyed one Lavochkin-5FN, almost an equal to Germany’s Messerschmitt ME.109G and Focke-Wulf-190; two Lavochkin7s-by then, Russia’s best fighter, the only one to have shot down a German jet; one P-39; plus 10 more Soviet aircraft of various types in 48 hours. The loss of just five IAR 81s was greater than these low numbers suggested, however, because Alexandru Serbanescu was among the fallen. Although Romania’s second-highest-scoring ace, he achieved the extraordinary feat of shooting down one Soviet bomber and five Aircobras, two of them in 24 hours, during the last 10 days of May 1943. Serbanescu was an expert hunter of Shturmoviks, the Russian nemesis of Axis ground forces, accounting for 14 of these “cement bombers;’ plus 41 other Allied warplanes, before he was killed by an American P-51 on August 18, 1944. But the lecture went unheeded. At a given signal from the King, soldiers arrested Antonescu and his cabinet members, all of them taken in charge by Communist partisans with whom the monarchists were cooperating. That same evening, Mihail broadcast a cease-fire, but it did not prevent the Soviet offensive from crashing into Romania. He pleaded with his people to offer no resistance, urging them instead to appease the invader by taking up arms against their German ally, who had not been informed of his decision. The King’s announcement threw his country’s armed forces into utter chaos. While some were paralyzed with inaction, others continued to fight the on-going Russian offensive beside their German comrades of the previous three years. In the skies overhead, FRAR pilots were no less confused. With the collapse of any organized resistance, Soviet forces swept into Bucharest on August 31. Part of the deal Mihail cut with them was to turn over all German officers and men, including wounded, none of whom were seen again. With a stroke of his pen, the Fortelor Regal ale Aeriene Romana was abolished, absorbed by the 5th Soviet Air Army, and former FRAR flight crews were obliged to continue the war against Germany, as were all armed forces personnel. On September 22, they were part of a Red Army offensive aimed at smashing an already attenuated Panzer corps defending the Turda region. Most Romanian soldiers followed orders under duress, but their heart was not in the fighting. They felt shamed by their weak King’s opportunistic betrayal to the despised Communists. The formerly vigorous conquerors of Bessarabia and Odessa had been reduced to reluctant cannon fodder, some 30,000 of them falling over the next nine months at the behest of their Soviet taskmasters. Defections grew to such proportions that desperate measures were employed to curtail them. When the Romanian pilot of a Henschel-129 broke formation to head for German-occupied Hungary on February 9, 1945, a fellow Romanian, Corporal Gheorghe Crecu, shot him down. Crecu was awarded the “Order of the Red Banner” by his Soviet superiors. There were other vdnatori who had no compunctions about turning on their former allies. Virtually all of them were ideologically indifferent, acting under orders supposedly of their King, who continued to play the role he knew best: as a compliant figurehead for whoever controlled his country at the time. Others regarded aerial combat as nothing more than a sport, in which an opponent’s insignia was irrelevant. On September 8, the first day of supposedly joint operations between the newly reformed Corpul 1 Aerian Roman and the V.V.S. got off to an ominous start when Adjutant Gheroghe Buholtzer was shot down and killed “by an over-zealous female Soviet flak gunner,” according to Bernad. “This was only the first of a series of fatal incidents in which Soviet flak crews erroneously (or deliberately) shot down German-built aircraft flown by Romanian pilots:”‘ Tension between vdnatori and Russian airmen was so high by war’s end, they came to blows on May 4, 1945, when Lieutenant Dumitru Baciu and Executive Officer loan Milu were attacked by a pair of Soviet fighters flying over northern Hungary. Trying to evade confrontation, Milu crashed in Austria, but Baciu turned to destroy one of the Yak-3s, then landed near the town of Kremsler. Baciu was murdered shortly after the war. Romanian fighter pilots who had flown so effectively against Russian and Anglo-American opponents from 1941 to 1944 performed far less admirably when faced by German opponents during the war’s last eight months. In less than two weeks, Unteroffizer Heinrich Tammer alone shot down 10 Romanian aircraft flying for the Soviets, thereby exceeding the combined score of the vdnatori in operations against their former comrades-in-arms. Another Luftwaffe ace, Leutnant Peter Duettmann, destroyed three IAR 80s in just 12 minutes. During 25 aerial battles together, the Romanians could claim just 3 kills for the loss of 17 of their own. Even these meager successes were mostly achieved over aircraft less able to defend themselves, such as Lieutenant Ion Dobran’s destruction of a Junkers-188 in September 1944. Return fire from the medium-bomber also brought down its attacker. The FRAR’s last mission was no less dismal. Although the Germans had already surrendered on May 9, 1945, their anti-Communist allies in the Russkaya Osvoboclitel’naya Armiya still offered stiff resistance to the Soviet occupation of Czech territory. Attrition of V.V.S. aircraft had by then left their commanders with so few warplanes, they drafted what was left of the Romanian pilots to wipe out the Russian Liberation Army. In 1,160 sorties flown against ROA troops lacking air cover, the vdnatori achieved little for the loss of 10 fighters to ground fire. In the days that followed, King Mihail predictably fled into exile when Ana Pauker (born Hannah Rabinsohn), the postwar Stalinist premier, abolished his monarchy and brought Romania solidly into the Soviet Bloc. There it would remain as an impoverished tyranny until the regime of Nicolae Ceaucescu was overthrown by popular revolt in 1989. During the 44 years of that unrelieved nightmare, even aircrews that flew for the Reds after August 1944 were regarded with suspicion by the Moscow-dominated authorities. All of them, save those few pilots who ostensibly embraced Communism, were expelled from the service without pension and forbidden to fly. Many found themselves jailed for “conspiracy against the social order;” a retroactive charge aimed at criminalizing their wartime experiences prior to the Soviet occupation. Among these hounded veterans was Dan Valentin Vizanty. Released from prison, Romania’s fourth-ranking ace and leading destroyer of Anglo-American bombers was prevented from earning anything more than a subsistence living as late as 1977, when he finally escaped to France. In the course of their World War II flight operations, Vizanty and his fellow fighter pilots destroyed more than 1,200 enemy aircraft in the air and on the ground, for the loss of slightly more than 100 of their own killed in action. Although the vdnatori are largely unknown to the outside world, every year since the day Alexandru Serbanescu died in 1944, his comrades hold commemorative ceremonies at the Ghencea Military Cemetery grave site of Romania’s extraordinary airman. Elsewhere in Bucharest, traffic today moves along Alexandru Serbanescu Boulevard. This entry was posted in Air Warfare, Aircraft, Axis by MSW. Bookmark the permalink. A fascinating and detailed account of one of the rare occasions when an air force fought with and then against Axis forces during the war. 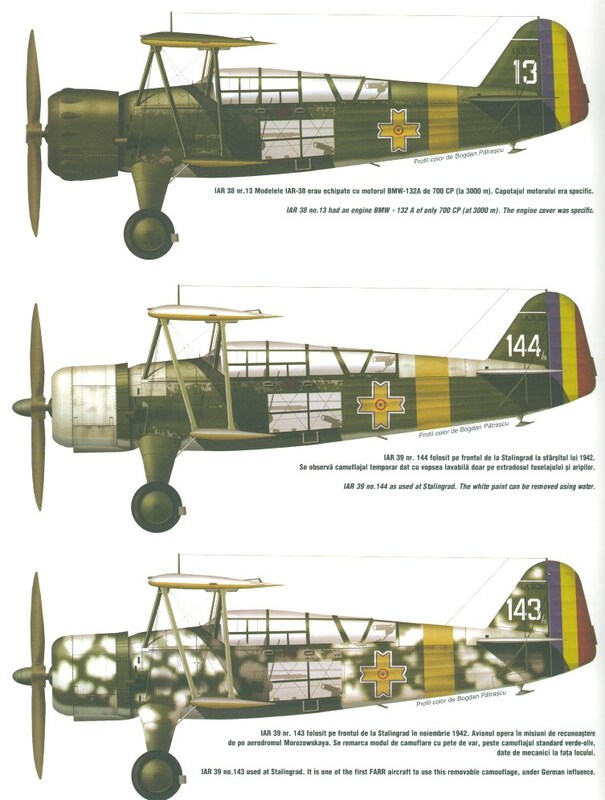 After Romania changed sides in 1944, did any aircraft still use the “Cross of King Michael” roundel, or did Romanian pilots fly with aircraft using either German and Soviet markings?